It is aston­ish­ing to me, look­ing back…how many dif­fer­ent kinds of people—Suffragettes, Sinn Fein­ers, Com­mu­nists, Egyp­tians, and the usu­al per­cent­age of ordi­nary lunatics—have from time to time shown a very great want of appre­ci­a­tion of my pub­lic work. To be guard­ed and shad­owed day and night…is only ren­dered tolerable…by the extra­or­di­nary tact, cour­tesy and skill of those entrust­ed with the duty of watch­ing over pub­lic per­sons, who, at par­tic­u­lar times, are thought to be wor­thy of pow­der and shot. He’s still wor­thy today—although the pow­der and shot of his­to­ry is dig­i­tal not lit­er­al. Let’s face it: the web is where peo­ple GO. So much of it warps real­i­ty. A recent sur­vey revealed that most British school­child­ren think Churchill was a myth­i­cal fig­ure and that Sher­lock Holmes was a real per­son in his­to­ry. But here’s the good news. Churchill has defied this moth­er load of igno­rance. His social media crit­ics don’t go unan­swered any­more. Some­times the answers are from peo­ple we’ve nev­er heard of, who take the trou­ble to learn the truth. Last month a for­mer U.S. astro­naut, who said some­thing nice about him, craven­ly apol­o­gized when dunned by Tweets claim­ing Churchill was a racist who starved the Ben­galis in 1943. He was greet­ed with a cacoph­o­ny of dig­i­tal guf­faws, refer­ring to a dozen dif­fer­ent web­sites that dis­prove such non­sense. As a writer I have to be glad for all this calum­ny. After all, it fur­nished me with enough mate­r­i­al for a book, Win­ston Churchill: Myth and Real­i­ty, which Ron and I will be hap­py to sell you tonight. Alas it’s already out of date, because new charges are con­stant­ly invent­ed. I think we should be encour­aged and heart­ened by such defens­es. We didn’t have near­ly as many allies five or ten years ago. We owe thanks to dili­gent efforts of Churchillians like your­selves. Which brings me to the many soci­eties like this one. …like the one I found­ed fifty years ago, are increas­ing­ly creaky—like me. Peo­ple just don’t join clubs the way they used to. The exchange of infor­ma­tion and opin­ion they offer is freely acces­si­ble with a gad­get you hold in your hand. Yet local soci­eties, like this one, are going strong. What past polit­i­cal fig­ure can you think of, besides per­haps Lin­coln, who engen­ders such enthu­si­asm? The more advanced Churchill soci­eties, like this one and Vancouver’s, wel­come speak­ers on cur­rent events—not nec­es­sar­i­ly about Churchill, but keep­ing Churchill firm­ly in mind. It’s a remark­able cred­it to a man who real­ized the val­ue of encour­ag­ing infor­mal dis­cus­sion by all shades of polit­i­cal opin­ion when he found­ed his own club for that pur­pose 107 years ago. In Wis­con­sin they named theirs after it. They call it the Oth­er Oth­er Club. …his rep­u­ta­tion stands. Crit­ics arose soon after the war. In 1957 Lord Alan­brooke pub­lished his frus­trat­ed, late night harangues with Churchill—and then apol­o­gized to him for leak­ing those pri­vate diaries. Brooke’s fum­ing is often used to show Churchill’s feet of clay—and Lord knows he had them. But late­ly we’ve seen anoth­er side of Brooke—as when the PM arrives in France after D-Day. “I knew that he longed to get into the most exposed posi­tion pos­si­ble,” Brooke wrote. “I hon­est­ly believe that he would real­ly have liked to be killed on the front at this moment of suc­cess. He [often said that] the way to die is to pass out fight­ing when your blood is up and you feel noth­ing.” I think that lit­tle aside, by a fre­quent­ly cit­ed crit­ic, cap­tures a key aspect of Churchill. Books about him keep pil­ing up. At Hills­dale we’ve reviewed 100 since 2014, twen­ty per year. Yes, a few dwell in mud­dy byways, half-baked his­to­ry. Some are pret­ty grim. To para­phrase Sir Win­ston, in war you can only be killed once—but by writ­ers, many times. And yet, 144 years on, his rep­u­ta­tion sur­vives. Think of all the real­ly good books we’ve had just this year. Lewis Lehrman’s Churchill and Lin­coln, a schol­ar­ly com­par­i­son of two dom­i­nant states­men. Antoine Capet’s exhaus­tive ency­clo­pe­dia, Dic­tio­n­naire Churchill. David Lough’s My Dar­ling Win­ston, the insight­ful let­ters between WSC and his moth­er. Brough Scott on his life with hors­es, Churchill at the Gal­lop. Jill Rose’s Nurs­ing Churchill on his health in wartime. Lar­ry Kryske’s Churchill with­out Blood Sweat and Tears applied his lead­er­ship prin­ci­ples to mod­ern liv­ing. Leslie Hossack’s Chart­ing Churchill is a beau­ti­ful pho­to doc­u­men­tary of Churchill’s Lon­don. Piers Brendon’s Churchill’s Bes­tiary is a schol­ar­ly account of his rela­tions with and allu­sions to ani­mals. Hills­dale College’s The Churchill Doc­u­ments offer mas­sive new pri­ma­ry source mate­r­i­al from D-Day through 1945. All these books are reviewed, with order­ing links, on Hillsdale’s Churchill web­site. The crown­ing achieve­ment is Andrew Roberts’ Churchill: Walk­ing with Des­tiny. Full dis­clo­sure: I was one of Andrew’s read­ers and kib­itzers. Togeth­er with the tena­cious Paul Courte­nay, we exchanged a thou­sand emails. We ran down facts and fac­toids, from the Roy­al Library to gos­sip columns, argu­ing out every con­clu­sion. With Hillsdale’s help, we checked even the unpub­lished parts of Sir Mar­tin Gilbert’s “wodges”: doc­u­ments, clip­pings and diaries cov­er­ing almost every day of Churchill’s life. We didn’t agree about every­thing, but the aver­age isn’t too bad. This was the first biog­ra­phy I’d proof­read since William Manchester’s The Last Lion, so I am per­haps qual­i­fied to com­pare. No one will ever reach the lyri­cal heights of “Hor­atius at the Gate,” as Man­ches­ter did. Andrew is how­ev­er far more insight­ful, accu­rate, up to date, and crit­i­cal where he needs to be. Walk­ing with Des­tiny is I think the best sin­gle vol­ume life of Churchill you can read. Con­sid­er­able? It seemed impos­si­ble. The great his­to­ry had stalled after the 1941 doc­u­ment vol­ume. Undaunt­ed, Dr. Arnn reprint­ed all twen­ty-four pre­vi­ous vol­umes, most of them out of print. Since then, helped by the Churchill Fel­lows, our ded­i­cat­ed stu­dent researchers, Hills­dale has pub­lished five more, tak­ing the doc­u­ments through 1945—seven vol­umes in all on World War II. In June, the 31st and final vol­ume com­pletes the job Ran­dolph Churchill began fifty-six years ago. We cel­e­brate with a cruise around Britain and a Lon­don ban­quet. But this is not the end, or even the begin­ning of the end…. The Churchill Project’s endow­ment finances an array of activ­i­ty: sem­i­nars, online cours­es, con­fer­ences, tours and pub­li­ca­tions. We are build­ing the largest Churchill archive in North Amer­i­ca, housed in a new pur­pose-built Archives build­ing. 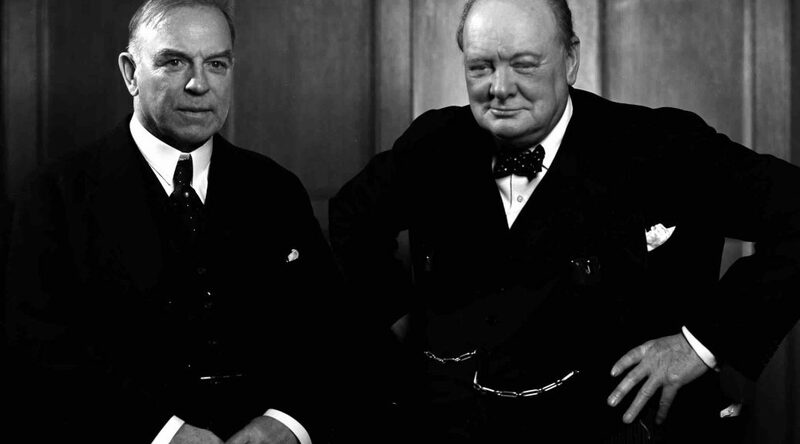 It includes the Mar­tin Gilbert Papers—all of them, on 20th cen­tu­ry and Jew­ish his­to­ry as well as Churchill. My own library and papers are in trust for it. We are 2/3rds of the way to a $9 mil­lion endow­ment. Hills­dale main­tains a Cana­di­an link through its recog­ni­tion by your CRA. So your sup­port too is tax-deductible. My first sur­prise when I joined Hills­dale in 2014 was to find so many young peo­ple with a keen inter­est in the great man. They have var­ied opin­ions and quest­ing minds. My sec­ond sur­prise was the events. There is no reg­is­tra­tion charge. They’re free, whether online, on cam­pus, at the Kir­by Cen­ter in Wash­ing­ton, or else­where. We even pro­vide lunch­es and din­ners. You just have to get there. The secret is own­ing most of the nec­es­sary real estate and pre-financ­ing expens­es. 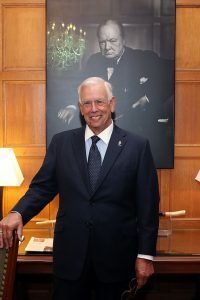 With the Offi­cial Bio behind us, the Churchill Project will turn to events, online edu­ca­tion, and new pub­li­ca­tions. We want to repub­lish the Col­lect­ed Essays—adding all Churchill arti­cles which the orig­i­nal vol­umes omit­ted. Togeth­er this work is some­thing great and last­ing, to “keep the mem­o­ry green and the record accu­rate,” as Lady Soames charged us to do. And all of it is financed and set in stone to con­tin­ue long after we are gone. This is the only way, in the long run, to assure that Churchill’s states­man­ship will be rec­og­nized and stud­ied for­ev­er. Thomp­son also wrote Guard from the Yard (1938; re Churchill and oth­ers) and I was Churchill’s Shad­ow (1951). You can find them on Ama­zon and Bookfinder.com. Unfor­tu­nate­ly Guard from the Yard is rare and expen­sive. Churchill’s quip about being “guard­ed and shad­owed day and night,” in my post above is from that book. Thomp­son ref­er­ences are plen­ti­ful through­out my web­site. See par­tic­u­lar­ly my notes on his TV mini-series and his amus­ing remem­brances of being a car pas­sen­ger with the boss dri­ving (a con­sum­ma­tion devout­ly to be avoid­ed). Just type “Wal­ter Thomp­son” into the “search” box and you’ll find oth­er ref­er­ences. Today I fin­ished a very infor­ma­tive book by Inspec­tor Wal­ter H.Thompson “Assign­ment: Churchill,” 1955. He risked his life for 26 years pro­tect­ing WSC. It is a whole dif­fer­ent per­spec­tive of the great man. I feel it added great­ly to our knowl­edge of Churchill. In all my books I almost nev­er read an expe­ri­ence from Thompson’s book. Please let me know what is your take on this?